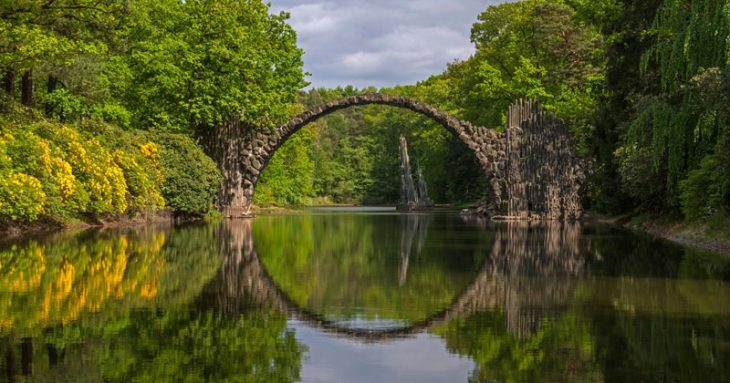 Our friends at National Geographic have just published “The World’s Most Spectacular Bridges“, a list that features 12 picturesque bridges from around the world that are sure to have adventure-seekers, engineers, bikers and romantics checking these bridges off their bucket lists. Nat Geo has kindly let us share some of the interesting bridges from the gallery, but be sure to check out the full article for complete information and travel tips. Qâ€™eswachaka, one of the last surviving Inca rope bridges, has spanned 124 feet across the Akpurimac canyon for more than 500 years. A traditional dingbu bridge, made of cut and sunken stones, stretches across the Tuojiang River in Chinaâ€™s Phoenix Ancient Town. Completed in 2004, Heatherwick Studioâ€™s Rolling Bridge provides access to the Grand Union Canal in Londonâ€™s Paddington Basin. Visitors can take a gondola ride underneath the romantic Bridge of Sighs, or explore the palace inside. Over three million vehicles cross San Franciscoâ€™s Golden Gate Bridge every month. The name gives it all away. The Living Root Bridge is made from living, grounded tree roots so that it is not washed away by floods. At 1,620 feet long, the Charles Kuonen Suspension Bridge in Zermatt is the longest suspension footbridge in the world. Book Cheap & Luxury Accomodation Worldwide on Booking.com! Free accomodation, stay with locals! Book Cheap Hostels & B&B´s On Hostelworld!